It's hard to argue against the EX-T package. Turbo engine, a few creature comforts, and the same great available safety package for just a few hundred dollars more. Splurge on that, you won't be sorry. The 2017 Honda Civic gains a hatchback body this year, but we were already sold. It's a very good compact car. 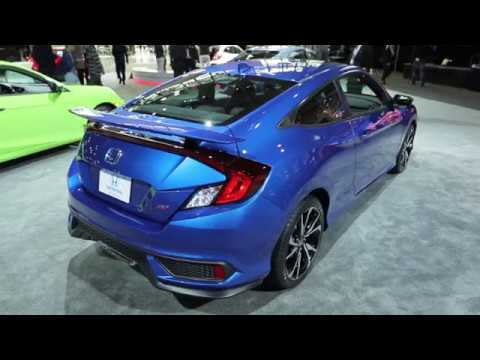 There's not much more we can add about the new Honda Civic, which was completely redesigned for 2016. Rather, the automaker has decided to do that for us: New for 2017, Honda offers the 10th-generation Civic—now in the fifth decade the car has been available in the U.S.—as a sedan, coupe, and now hatchback. The Swindon, England-built hatchback will complement a lineup that's already solid for Honda. Honda offers the Civic sedan starting with LX cars at the base, up to EX, EX-T, EX-L and Touring trims. 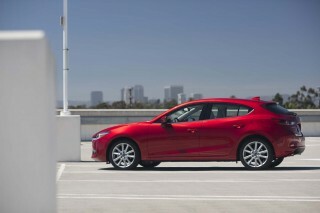 The coupe varies slightly from that formula (but not much), the Hatchback wanders a little further. 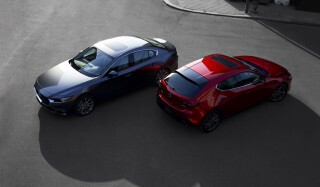 The hatchback is offered in LX, Sport, EX, EX-L Navi, and Sport Touring trims; the Sport trims are exclusive to the Hatchback. Honda offers the Civic Si in coupe and sedan forms with a more potent turbo-4 and a slick-shifting 6-speed manual. It also sells the Civic Type R, a 306-hp track-ready model with the hottest performance ratings of all. The 2017 Honda Civic isn't the most daring design from Honda in a while, but it's certainly the first in a while that actually works. The exterior of the Honda Civic is busy if nothing else, but it looks sharp by us. The coupe and sedan have been around for a year—and aged well so far—but new for 2017 is the hatchback, which adds its own flair from the rear doors back. It won't be for everyone, we'll admit, but it is distinctive and ultra-aggressive in Type R guise. The interior may be a letdown based on the busy exterior, but it's magnitudes better than the two-tier dash layout we saw just a few years ago. The cabin's a bit more tame and well organized, with a broadly horizontal look and a single screen has replaced the dual-screen tiered design of the last Civic. Most versions have analog gauges, but the priciest Civic gets a digital display. Under the hood are a pair of powertrains that range from fair to fairly good. 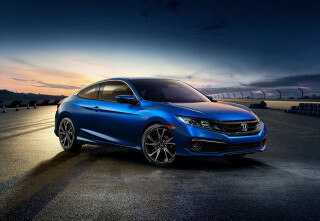 Base Civic sedans and coupes are powered by a 2.0-liter inline-4 that makes 158 horsepower and is paired to a 6-speed manual or automatic continuously variable transmission (CVT). That engine is fine for daily commutes, but considering the small cost of upgrading to the uprated turbo, we ponder its continued existence. That turbocharged engine in EX-T, EX-L and Touring models (standard in the hatchback) is a 174-hp inline-4 that can also be paired to a 6-speed manual or CVT. It's the efficiency champ, and the most fun to drive. Complete with more athletic running gear, the Civic can be a sporty runner on the weekends with a quiet composed ride to work on the weekdays. Moving up to Si trim gets a hotter turbo-4 that makes 205 hp and 192 pound-feet of torque. It's mated exclusively to a 6-speed manual with a shorter throw than the base Civics. It's the performance king—for now—but doesn't sacrifice fuel-efficiency. It's rated at 32 mpg combined. In the Type R, the turbo-4 makes 306 hp. Most Civics will manage around 35 mpg combined, according to the EPA. That's about as good as it gets without strapping on battery packs these days. Civic sedans will hold four adults comfortably without sacrificing interior space for water bottles, phones, iPads, or whatever millennials carry around these days. The Civic is longer, lower, and wider than it ever has been, but it's also lighter. Although it typically competes against compact cars, the Civic is anything but. Thanks to clever packaging and a low seating position, the Civic is larger than some of its rivals including Mazda and Ford, and can be a mid-sizer in some respects. In upper trims, the Civic benefits greatly from hydraulic rear bushings in its rear suspension that soaks up bouncy roads and keeps the Civic pointed in the right direction during spirited driving. If things go pear-shaped during that spirited drive, the Civic boasts one of the best safety scorecards of any car on the road today. It aced federal testing, aced IIHS testing, and nearly aced our battery. Good, useful active safety features—available across the board, not just on top trims—add to our confidence that they don't come much safer than the Civic. It's only (small) blemish is the sub-standard headlights, as rated by the IIHS. Base cars are equipped with 16-inch wheels, automatic climate controls, electronic parking brake, automatic headlights, LED taillights and daytime running lights, Bluetooth connectivity, a modest four-speaker stereo, a 5.0-inch display (look, but can't touch), rearview camera, and a low-power USB port that may struggle to charge quickly that massive phablet you just bought. Coupes, sedans, and hatchbacks can all add an impressive number of options including leather, 7.0-inch touchscreen with Apple CarPlay and Android Auto, premium stereo, or 18-inch wheels, but most are walled within packages—not free-floating options. There's a lot going on inside and out, and the Civic is all the better for it. Here's Honda hitting a stride. We admit there have been missteps here before. Old Ridgeline pickups and Crosstour sedans had funhouse-mirror angles and looks; their best efforts fell flat to the competition. Last year, Honda introduced us to the Civic sedan and coupe, the 10th generation for the automaker, and one of the best. We think it's one of the best-drawn, sleekest shapes on the road. There are hints of the Crosstour here in the sedan, but the wonky attributes have been smoothed over. It's more formal, more busy in appearance than the simpler deep-set grille on, say, the new HR-V hatchback. Down the side, the Civic's big wheel wells intersect with steeply surfaced sills; at the rear, the lovely roofline tapers into another set of bracketed lamps. This year the Civic has evolved into a five-door hatchback and its chunky exterior won't appeal to the mainstream. We like that. The sedan shape and proportions are all there, but from the rear door back, it has a verve all its own. The exterior styling is exciting, maybe to a fault, but the cockpit is more tame and just as effective in correcting past miscues. It adopts a broad, horizontal theme, not unlike recent BMWs in the bow and swell of the major trim pieces. Thick at the driver side, it tapers as it moves toward the passenger door, paneled with embossed metallic trim. The old two-tier dash has been banished to some third-world automaker's future design notebook; in the Civic, the clutter of screens is now focused on one area, where a 5.0-inch base color screen grows into a 7.0-inch touchscreen on the nicer trim levels. Facing the driver in base models is a clean, crisp set of real dials; on pricey Touring models, the dials are swapped out for an LCD screen with a 270-degree tachometer arc framing a digital speedometer. It's not a little ironic that the Civic's digital display shows real digits, while other automakers are using super-wide TFT panels to mimic the dials they virtually ripped out. The Si gets its own flair, notably in the inclusion of a decklid spoiler (sedan) or taller wing (coupe) that feed into the boy-racer look. Type Rs wear even more extravagant aero add-ons, a massive spoiler, red-stitched interior trim, and lots of extra badges. We're fans of the sedan's more understated approach, but admit that taste is entirely relative. It's best handling and ride from a Civic to date. The available turbo engine makes it all the better. The 2017 Honda Civic has a split personality; one configuration is a pleasant commuter, the other is a more adventurous runner with a near-luxury ride. Wait until the ultra-hot Civic Type R shows up. The base Civic gets its power from a 2.0-liter inline-4 rated at 158 horsepower and 138 pound-feet of torque. 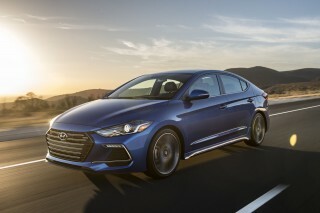 It's the base engine in LX and EX trims for the coupe and sedan, and delivers power to the front wheels via a 6-speed manual or an automatic continuously variable transmission (CVT). Though the engine is relatively new for Honda, the delivery is the same: it's a commuter special without much to make it remarkable. It fades into the background during most commutes. The CVT may be relatively unfamiliar for car buyers who haven't purchased or driven a new car recently. That type of automatic transmission doesn't use gears, rather pulleys and a belt that can mimic an infinite number of "gears" to keep an engine running as efficiently as possible. Accelerating through a CVT means wading through a slurry of infinite gear possibilities, which can feel imprecise and may be noisy. Honda's CVT is a little quicker and quieter than many others, but unlike Subaru's unit—which we also like very much—there are no paddle shifters to simulate gears. 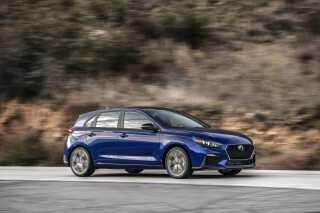 The optional turbo-4 (standard on the Civic Hatchback) is rated at 174 hp and 162 lb-ft of torque (167 lb-ft with the manual transmission and 180 hp with the Civic Sport Hatchback's dual exhaust) and makes the base inline-4 seem like less of a bargain. When factored in with the small upgrades, the more powerful engine is almost nearly the same price. The engine sounds Honda-sweet at full blast—not entertaining like the classic VTEC, but still happy enough. It's just as sharp as some of the old Civic Si models, but at lower speeds it feels like there may be a little of a tug of war between the turbo lag and slack from the CVT. The turbo model is still frugal, and returns the Civic's highest mpg—even more when the "Econ" button is pressed, cutting the A/C fan speed and slowing throttle response. The powertrains have their peaks and valleys, but in ride and handling, the Civic excels. This car is a magnitude more mature than the last generation. It's a wide-track Honda, up almost 2 inches across the front wheels, up more than an inch in wheelbase. It also has a thicker steering column, in part for better crash protection. So the Civic needed a more exotic steering system than in the past. Where Honda settled was on a dual-pinion, variable-ratio setup like the one on the Buick Verano—and an example of the more sophisticated electric power steering we've been promised for years. Instead of applying more turning force at the steering wheel, or even at the point where the column and steering rack intersect, this system lets the column move across the rack directly—while using a motor geared independently further across the rack to provide steering boost in a more gradual, better-buffered way. It's slightly more complex, but yields very good steering consistency when winding and unwinding in turns. The Civic also can apply a brake on the inside front wheel in a corner to tighten its line. The Civic's suspension setup is half-classically Honda. Up front are struts, in the back is a multi-link design with a solid rear stabilizer bar. The front struts are fitted with hydraulic bushings that quell harsh ride motions. In EX-T, EX-L, and Touring models (sedan and coupe); Sport, Sport Touring and EX-L Navi (Hatchback) models the rear bushings are hydraulic and it shows in improved ride quality. LX and EX models roll on unambitious 16-inch tires, higher trims hold on to grip and damp out ragged pavement well. These Civics don't bobble and dance over bumps, rather, they micromanage them. They filter off the economy-car levels of compliance we're used to feeling in the best-selling Korean and American compact cars. Add in firm, quick-reacting brakes with short pedal stroke, and the Civic has its performance act together in a way it hasn't, really, since the middle of the last decade. The 2017 Honda Civic Si arrived to fill a performance space left between the Civic Sport and Civic Type R. The Civic Si relies on an uprated version of the 1.5-liter turbo-4 found in the Civic EX-T and higher models, but increases the boost to crank 205 hp from the busy little engine. It's fluid-filled suspension bushings were replaced with solid fixtures for better steering feel and feedback. A 6-speed manual, adapted from other Civic models, is the only transmission available in the Si and like most other Honda gearboxes, it's good. A shorter throw than the Civic Sport and a smooth clutch help wring the turbo-4 out on long jaunts. The Civic Si lacks VTEC power this time around—just turbos—but retains the helical limited slip differential and electric power steering rack from the last generation. The new Si is true to its performance heritage; at just under $25,000 to start, it's value speaks volumes. It may lack the wail of previous generations, but with just enough performance to satisfy most curious new-timers, the Si conveniently fits in the Civic lineup. In the Civic Type R, extra boost from the turbocharger and lots of small weight-saving changes net out at 306 horsepower and 295 pound-feet of torque to the front wheels, via a 6-speed manual transmission. The staggering increase posts up on the Civic Si by 101 hp. To make sure all that power reaches the pavement, Honda fits a standard helical limited-slip front differential. A three-mode drive selector toggles some driving efforts from normal to Sport and +R track modes. Honda doesn’t peg 0-60 mph times, but low-five-second times are in reach. The Type R has a sport-tuned suspension and massive 20-inch tires that give it unparalleled grip. It's a grin-inducing surprise to see how well the Civic handles all the extra power, and credit goes to the stiffly tuned suspension in +R mode. It's not a particularly noisy sports coupe, either, and ride quality is livable on a daily basis, something we can't say about rivals like the Focus RS or WRX STI. On the track it takes more finesse than those all-wheel-drive machines, but on the road, the Civic Type R trounces them all. It's not the same compact as before; four will find enough room for their feet, gear, and beverages in the new Civic. The Honda Civic was all-new last year, a much needed makeover for the compact car since its last iteration firmly flopped. Except, it's not so much a compact car anymore. By some measures, it's a mid-sizer; in others, not so much. The Civic has grown in nearly every dimension over the past few years, except for one: the new Civic weighs less than older models. By the numbers: The Civic sedan wraps up 112.9 cubic feet of space in its 182.3 inch long body. That's bigger than the Mazda 3 (108 cubic feet) and the Ford Focus (103.2 cubic feet), but smaller than the Chrysler 200 (117.4 cubic feet). The numbers matter, but so do how Honda uses the available space. The slimmer, tailored front bucket seats sit much lower than before, and for some of our taller editors had to be adjusted higher to find a good driving position—a rarity for our long-legged payroll. The dash structure is less pronounced than before, and the tilt/telescoping steering has a longer stroke, so finding an ideal driving position is easy for a wide range of body types, though the prominent headrests might push too far forward for some. There's excellent leg room and a comfortable incline to the footboard—most won't find any issue with available head room either. Coupes are a little more cramped in the rear seat—predictably, but both sedan and coupe models punch above their weight classes thanks to a very high perceived feeling of quality. Most of the cost-cutting is out of sight; an unlined trunk lid and exposed hinges are places we can see that they've saved money. The good news is that we don't see those places very often. Which is exactly where you want your cost-cutting to be? We have ergonomic issues: we'd trade the climate control knobs for volume and fan speed controls; the steering wheel controls don't inspire confidence, the passenger seat can't tilt its bottom cushion at all, and we needed time to adjust to Honda's LaneWatch system that projects the view from a side mirror-mounted camera onto the touchscreen to cover the blind spot—sitting at long lights with the blinker on rendered the infotainment system inoperable. From the B-pillar—the roof support just aft of the front seats—to the front of the hood, the Civic Hatchback is the same as the sedan. Inside, front and rear seat passengers won’t know which Civic they’re in unless they pay close attention to some minor trim color changes. Behind the B-pillar—the roof, doors, fenders, and, of course, tailgate, are exclusive. That cargo area affords 25.7 cubic feet of cargo room in most models behind the second row (that’s 10 cubic feet over the sedan), and a bike-swallowing 46.2 cubes with the rear seat folded forward. That's impressive considering the Hatchback, which was designed for congested European streets, is about 4 inches shorter than the sedan. The Civic Hatchback also features an innovative cargo cover that slides out from either side of the cargo area; it can be positioned on either the left or the right sides. There's a minimal difference in terms of road noise between the Civic Hatchback and its sedan and coupe siblings. Our ears could only discern a minor increase in ambient noise at higher speeds thanks to the hatchback's open cargo area. Its cargo cover is bulky enough that it seems to block out most additional noise. With better headlights, the Civic could see a perfect score. The 2017 Honda Civic manages some of the best safety ratings on the road today and can be fitted with some remarkable active safety features. Every Civic gets the prerequisite airbags and stability control, with hill-start assist. A wide-angle rearview camera is standard, and so is Bluetooth. And praise be, Honda has finally uncoupled its most advanced safety features from the top trim levels of its products. So while features like adaptive cruise control, lane-departure warnings, and forward-collision warnings with automatic braking are standard on the top Touring level, they're available on all other versions, even on the base Civic LX. You may have noticed that we didn't mention the coupe earlier. That's because federal testers only give the two-door model a four-star rating in front crash safety although the IIHS doesn't make the same distinction. We're basing our rating on volume models, the sedan outsells the coupe, but we're all for full disclosure here. In addition to very good crash scores, the Civic also manages to have excellent outward visibility. We haven't yet driven the new hatchback model, so we'll report back on that version as soon as we log those miles. The 2017 Honda Civic covers wide ground quickly, but most of the options are walled off in increasing trim packages. Honda Civic shoppers have no shortage of options when looking to purchase a new model—except most are confined to packages rather than free-floating options that can bolt on anywhere. Starting with base LX models, the Civic sedan is offered in EX, EX-T, EX-L, and Touring trims. Want two fewer doors? Coupes are available in LX, LX-P, EX-T, EX-L, and Touring trims. Want to go the other way and have more doors? OK. The Civic Hatchback is offered in LX, Sport, EX, EX-L Navi, and Sport Touring trims. The aforementioned list of trims reads like a crowded bowl of Alpha-Bits, so we'll do our best to get down to the milk. LX models get automatic climate controls, electronic parking brake, 16-inch wheels, automatic headlights, LED taillights and daytime running lights, Bluetooth connectivity, a modest four-speaker stereo, a 5.0-inch display (look, but can't touch), rearview camera, and a low-power USB port that may struggle to charge quickly that massive phablet you just bought. EX models generally add a few more creature comforts such as keyless ignition, rear-seat armrest, 17-inch wheels, 7.0-inch touchscreen with Apple CarPlay/Android Auto and internet radio streaming, upgraded eight-speaker stereo, remote start, a higher power USB charging point, and Honda LaneWatch that uses a passenger mirror-mounted camera to display what may be hiding in that blind spot. Coupes and sedans with the EX-T trims are largely the same, but swap the 2.0-liter inline-4 with a 1.5-liter turbo-4, and toss in a few amenities such as heated front seats and dual-zone automatic climate control. EX-L models add lashings of leather, power adjustable driver seat, heated rear seats, and available navigation. The Hatchback EX-L Navi? You've probably already figured that out. But you're not interested in letters. Rather, you'd like to pay just over $27,000 for your Honda Civic sedan. That's Touring-level country and that gets the full ride: Navigation, leather, upgraded 10-speaker stereo, LED lights and Honda's full active safety suite, which we cover separately. New for 2017 is the Civic Hatchback, which gets a couple unique trims in Sport and Sport Touring. Both trims add bigger 18-inch wheels, center mounted exhausts, a slightly uprated engine by 6 hp, and sporty accents such as an aero kit. Sport Touring gets its own booming stereo: 540-watts driving 12 speakers. Boom. 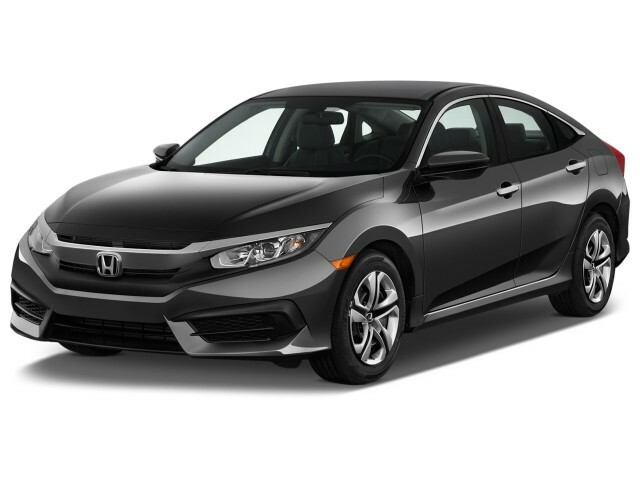 The Civic Si is equipped with standard 18-inch wheels, a center-mounted exhaust, adaptive dampers, Honda's 7.0-inch infotainment screen, upgraded stereo, 18-inch wheels (summer tires are optional), and deeper front buckets. Your Type R money—$34,775, with no options—translates into a Civic with 20-inch wheels with 245/30ZR Conti tires, a ton of aero add-ons, sport seats and pedals, performance meters, a sport steering wheel, 7.0-inch touchscreen infotainment, navigation, a 12-speaker 540-watt stereo, Android Auto and Apple CarPlay, dual-zone automatic climate control, keyless ignition, LED headlights, and a serial number plate on the console. Regardless of powertrain, body style—or your shirt size—the 2017 Honda Civic is remarkably fuel efficient. There's no hybrid model in the lineup anymore, but the Honda is remarkably fuel efficient regardless of what body style or engine you end up with. The base LX gets the lowest ratings of the bunch. The 2.0-liter inline-4 paired to a 6-speed manual transmission manages 28 mpg city, 40 highway, 32 combined in the sedan, according to the EPA—coupe models with the same engine aren't far off from there either. For many automakers, 32 mpg combined is the highest—not the lowest—ratings from their small car offerings. For example, it's the best a Nissan Sentra can do. Reach for the turbos, and you'll do better in the Civic than almost every other car. The Civic sedan, when equipped with the 1.5-liter turbo-4 and a continuously variable automatic transmission, is rated by the EPA at 32/42/36 mpg. The coupe with a similar powertrain isn't far off from that mark. But shop carefully, because the 18-inch wheels and the special body kit on Civic Hatchback Sport models drop those figures to a less impressive 30/36/32 mpg (non-Sport Hatchbacks come in at the same mpg as the sedan). 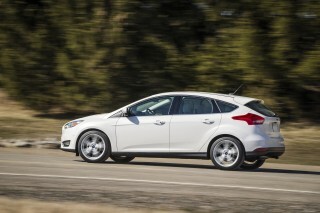 Manual Hatchback models, regardless of trim, come in at 30/39/33 mpg. 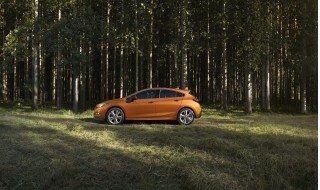 Civic Si models are rated by the EPA at 28/38/32 mpg in coupe and sedan forms. The Type R checks in at 22/28/25 mpg. Honda Civic is one of the popular car in Indian market. Its performance, styling and high reliability really made it an awesome car. This new Honda Civic is available in both Petrol and Diesel along with... Honda Civic is one of the popular car in Indian market. Its performance, styling and high reliability really made it an awesome car. This new Honda Civic is available in both Petrol and Diesel along with turbocharged 4-cylinder engine delivering a power output of 174 PS and torque of 220 Nm. 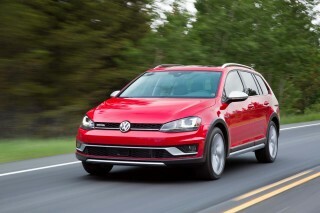 The diesel version is expected to be featuring a 1.4 iDTEC engine with improved performance factors. The Honda civic mileage for Petrol and diesel is around 15–20 kmpl which may vary depending on the performance factors and country specific design car. At the first moment you see a Civic approaching, you know that is an agressive city car, made for conquer the highways and your wallet. Economy, performance, great-looking, all thigs together.